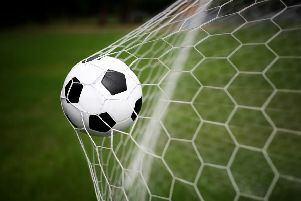 Little Common Football Club player-manager Russell Eldridge is determined to build on its best performance for a while as it enters an important week in its battle against relegation. Weather permitting, the Commoners will contest two Southern Combination League Premier Division games in the next four days buoyed by last weekend’s very creditable 2-2 draw away to eighth-placed Pagham. Eldridge said: “It was a pleasing performance. For the first time in a while we put a performance in as a group, whereas in recent times we’ve not shown that as a collective. “We made more tackles, created more opportunities, and in the end came away frustrated and disappointed because we felt on another day we could’ve won the game. But before the game if we’d been offered a point we would’ve bitten people’s hands off. “It was pleasing, especially after going a goal behind after a minute. It could’ve quite easily been ‘here we go again’, but we showed some good mental strength and resilience, and the good thing was we created some good opportunities as well. “I think it was the best we’ve played for a while. We probably did okay against Langney (in the 0-0 draw on Boxing Day) without really creating anything, but in this game we created some good opportunities. Common are fourth-from-bottom of the table, with two teams due to be relegated. They are three points above second-bottom Loxwood. “I think the boys will have that bit more of a spring in the step,” continued Eldridge. “Okay we didn’t win the game, but the performance levels were there. Common will travel to sixth-placed Broadbridge Heath tomorrow (Saturday) before hosting 12th-placed East Preston on Tuesday night, kick-off 7.45pm. Common lost 3-0 at home to Broadbridge Heath in September’s reverse fixture after missing a penalty while the game was goalless late in the first half. “We have to make sure first half we’re nice and resilient, make it difficult for them, and use our assets and pace going forward to cause them problems,” Eldridge added. “I expect a similar game to last weekend. Away from home I think sometimes suits us a little bit. “We’ve got to try to use that midweek game to our advantage in terms of being at home. Defensive duo Ryan Paul and Lewis Parsons are expected to return. Southern Combination League Premier Division bottom six (played-points): Shoreham 24-20, Langney Wanderers 24-18, Little Common 22-17, Arundel 23-16, Loxwood 23-14, Eastbourne United AFC 23-12.